About Stonkam Co., Ltd. - Products, News and Contacts. 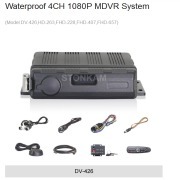 STONKAM CO., LTD, founded in 2003, is a National High-tech Enterprise with ISO/IATF 16949 certified and core competency in researching, developing and manufacturing of vision products and advanced driving assistance products for commercial and special vehicles, including HD rear view system, HD DVR, wireless recording system, 360°around view system, ADAS, etc. Today we have around 360 employees, including a R&D team of more than 60 senior engineers. our customers come from more than 150 countries and regions, including the USA, UK, Germany, France, Australia, Newsland, Latin American, Japan and etc, which makes our export rate hitting 99%. HD Rear View System: With high color restoration and anti-interference capability, the resolution of the system can be up to 1024 x 600. It supports HDMI input, marking a big leap from "visible" to "crystal clear" and a breakthrough in rear view monitoring picture quality. 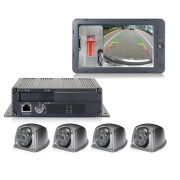 Touch-screen DVR System with 3G/4G, GPS and WIFI Function: The system can support 4-channel D1 real-time A/V recording and up to 4 x 128GB SD card storage for 720-hours recording. The settings of DVR can also be done remotely. 2.4GHz Digital Wireless Transmitting Recording System: The system is known for stronger signal transmission capability and outstanding anti-interference capability and confidentiality. Under barrier-free condition its receiving range can be up to 120 meters. 360° Around-View System: The blind-angle free monitoring ensures convenient parking and makes it easier to drive through complex road conditions so as to effectively avoid such accidents as scratching, collision and sinking. Advanced Driving Assistance System (ADAS): The system can warn the driver in advance to avoid rear-end collision and prevent the vehicle from potential accidents caused by lane departure. Our products can be widely applied to various vehicles and large mechanical equipments, including ships, trucks, buses, school buses, ambulances, garbage trucks, fire engines, agricultural vehicles, concrete mixer lorries, cranes, excavators, forklifts, road sweepers and hoists etc. FOR MORE INFORMATION CONTACT STONKAM CO., LTD.